There's no better location for a geology museum than at Norris Geyser Basin, the apex of Yellowstone's geothermal activity. The hottest and most active geological area in the park, it contains many of the hot springs, fumaroles, geysers and mudpots that have made Yellowstone famous. The museum explores the history and background of the park's 10,000 geological features. At least a third of the world's geysers are located at Yellowstone, and the largest, Steamboat Geyser, is located in Norris Geyser Basin. The museum overlooks Porcelain Basin, one of the area's largest conglomerates of geological features. Constructed in 1929-30 by architect Herbert Maier, the museum's stone and log structure serves as a classic example of "parkitecture" design. Following many of the architectural principles implemented by Robert C. Reamer with his design of the Old Faithful Inn in 1904, Maier strived to produce an organic, rustic appearance that epitomized nature, rather than embellished it. 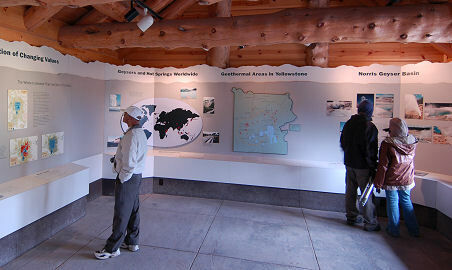 The Norris Geyser Basin Museum, along with the museums at Fishing Bridge Madison Junctions has been listed on the National Register of Historic Places for its architectural significance. They are also considered prototypes to the trailside museums that now frequent many national and state parks. The Norris Geyser Basin Museum is located ½ mile east of Norris Junction and is open 10:00 a.m. to 5:00 p.m. seasonally (June to September). The facility also includes a Yellowstone National Park Association bookstore.